The day is upon us. Wembley provides Fulham with another shot at glory. Back in 1975, West Ham proved just too strong for the Whites. Now another claret and blue obstacle stands in our way. Fulham fans never expect, but always hope. Nevertheless, the return to the national stadium has been long overdue. “You look at pictures of during the Cup run when you’ve got the team bus going around and you suddenly realise how distant a time 43 years ago was. “Between then and now, I’ve gone to work, retired It’s a big spread of time,” reminisces Glen, who was 17 at the time. In the pre-internet age, programme tokens were the way of getting your hands on a golden ticket. 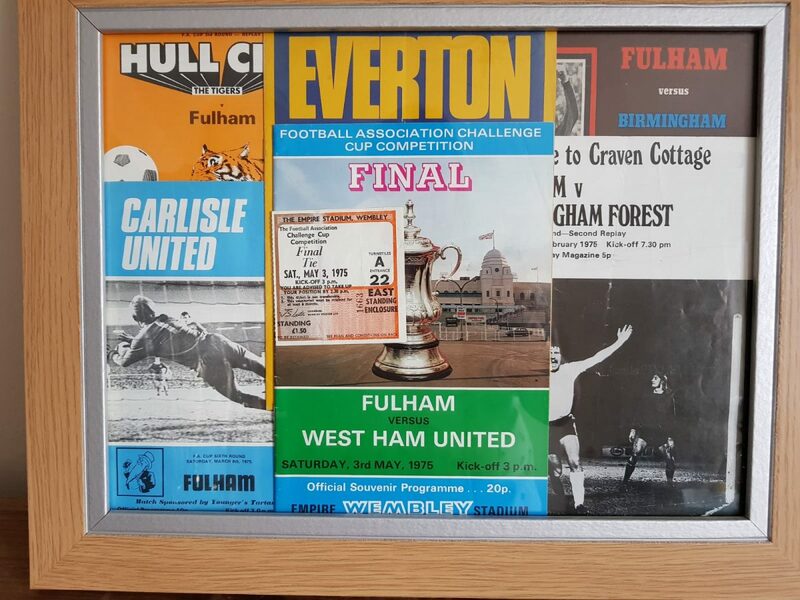 Stephen Date was one of the lucky winners and was driven to Craven Cottage by a West Ham-supporting cab driver to exchange them at the ticket office. “He drove me all the way from West Ham to Fulham that morning. No fare,” he recalls. The build-up was certainly not in keeping with Fulham’s status as a club that kept a low profile. Under the guidance of Alec Stock, they had charted a seemingly impossible route through to the season’s showpiece, disposing of three First Division sides and somewhat surprisingly, every win came away from Craven Cottage. The concept of extra time and penalties hadn’t been introduced, meaning teams would contest replay after replay until there was a winner. Fulham’s journey to the Final was the longest in history. This remarkable string of matches included four ties against Nottingham Forest, the last of which saw the enigmatic Viv Busby score twice to help the Whites progress. That meant a fifth-round clash with Carlisle United and a long trek up to Brunton Park. It was a day Wayne Bradford would never forget. “The players came on the train with us,” he remembers fondly. “I spoke to Alec Stock, got his autograph. One of Wayne’s most vivid memories is staying in, desperately waiting for news from the semi-final replay against Birmingham. He had gone to the first game at Hillsborough, but being just 12, the journey to Maine Road was not possible on a school night. West Ham, with Billy Bonds roaming the midfield, awaited and were probably slight favourites, but that underdog status did not dampen Stephen’s expectations. “I thought we were going to win it. I loved Viv Busby, he was on fire. Don Revie almost considered taking him into the England squad at one stage. Others concur that Moore, despite moving to SW6 in the twilight of his career, was up there with the best to have pulled on the black and white shirt. “It was amazing to watch him,” gushes Paul Baker, who attended the Final with a group which included Keith Allen. Saturday jobs were postponed for the occasion. “I used to do rounds as a milkman and get a couple of quid,” said Wayne, who went with his friend Paul. Sadly, the game didn’t go to plan for Stock’s men, with two second-half strikes from Alan Taylor taking the Cup to the East End for the second time in their history. If you want your son to play for Fulham, call him John. Stephen was not allowed to forget the result. Wayne’s recollections are somewhat more rosy. “It was me and my friend, along with 20-odd thousand Fulham supporters. It was just a fantastic day and all I remember is from the time we walked into Wembley, we never stopped singing, even when we were losing. Clubs were not considered merchandising machines as they are now, but thankfully Stephen has some tangible reminders. However, there are other, more poignant memories attached to the occasion. “My dad Bertie and I only had enough tokens to get one ticket,” Glen recalls. “So I ended up going. He died shortly afterwards. “A friend of mine is a Spurs supporter and they got to the final which then went to replays, so I managed to get tickets on both occasions [in 1981 and 1982]. Stephen is going to tomorrow’s match with his wife Christine and son Stephen, but working as a magnetic health jewellery on Romford Market means the decision does not come without its sacrifices. Wayne will be there with three generations of his wife’s family as well as his younger son Jack, who is, shock horror, a Chelsea fan. “He always gives us a big cheer until Fulham start singing about the blue flag,” Wayne chuckles. “I’ve already had a cheeky bet – 3-0, Mitrovic to score first. I really do believe Fulham will win this one. “I just feel it’s right for us and my only dread is if we lose, what would our team be like next year. The one we don’t want to see go is Slav. Will he give it another go? Despite the monumental changes that have taken place, the charm that characterises Fulham and Craven Cottage is still there for all to see. It keeps drawing Stephen back to the banks of the Thames. Now living in Falkirk, Glen is unfortunately unable to make the trip due to health reasons, but will enjoy the game in front of the TV with loved ones. He is happy with the owners. Stephen feels regretful about not inviting his dad along in 1975. “I hope it’s not another 43 years, because I won’t be around to see it, that’s for sure.